When we purchased our first home a few years ago, we had no idea the amount of cosmetic work it was going to take to remove the 1970s vibe that defined the entire inside of it. 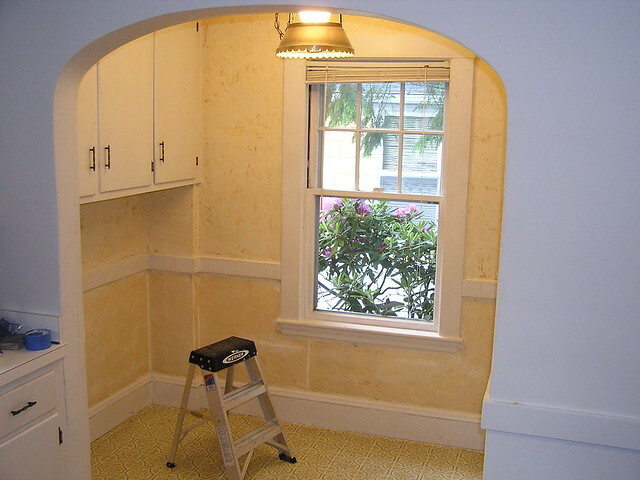 However, even though the house was outdated aesthetically, we fell in love with the feel of it, and started our massive effort to remove the multiple layers of wallpaper that plastered virtually every inch of wallspace in the house shortly after we moved in. It took a little over two years, but throughout 2008 and 2010, we removed all of it. 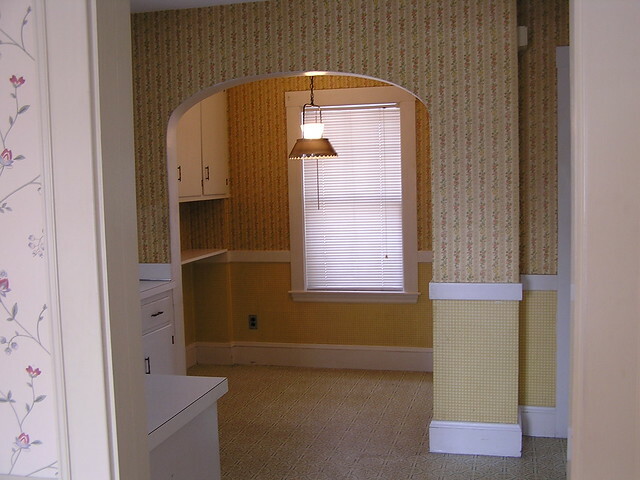 Some rooms that had more than one layer of wallpaper (only one layer can be removed at a time), took multiple weeks of scraping, and the one room that had been wallpapered then painted over took more than a month to get rid of. One of the rooms I am most proud of and spend the most time in is my kitchen. Before we began work on it, it was not a functional or warm space to work in, which made me incredibly motivated to improve it as much as possible. Although we never gutted it, we did make every possible cosmetic change we could with the space and existing dimensions the room presented, while staying within our budget. 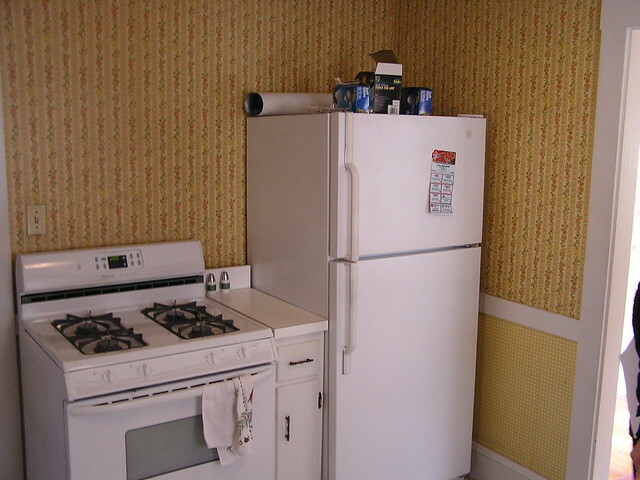 This is a picture of our kitchen right after we bought the house. As you can see, it was yellow, grimy and dated. After stripping, sanding and priming the walls, we applied pale blue, stark white and dark chocolate tones on the wall. We cleaned and repainted the grimy cabinets, and updated the hardware on them. 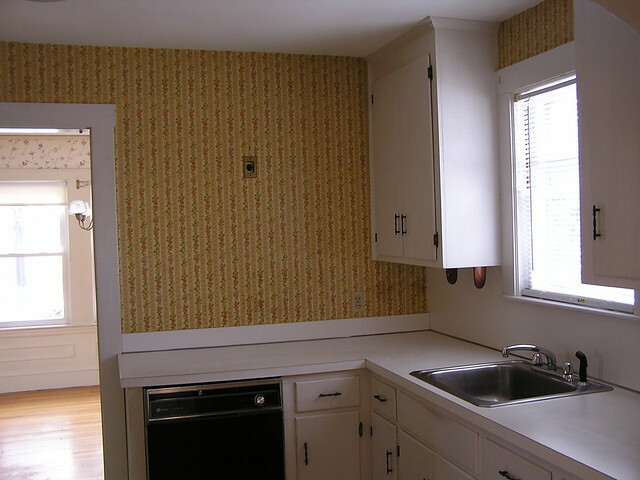 The old formica was updated with a new countertop, and we bought a new dishwasher to replace the old one. The first few months we lived here, there was virtually no counter space next to the stove. I remember chopping food next to the sink, then balancing it on a cutting board as I walked across the kitchen, then balancing it on another pot while I cooked. Not fun. So we moved the refrigerator out of the space and bought a wooden chopping block to take its place. This is now a fully functional workspace, and I love the pot rack that Jeff hanged from the wall, as well as the magnetic strip for knives and three spice racks nearby for ease of use. We unfortunately had to put that refrigerator someplace and it now sits in this nook, in front of the window. I especially love the arch leading into the nook. Double wallpaper fiasco! 70s wallpaper on top of 60s wallpaper! This took me two straight days of maniacal scraping with a combination of stripping chemicals and elbow grease—it was like removing stubborn gum from a sidewalk. 40+ year-old wallpaper on plaster walls = severe adhesion issues. Ready for sanding and priming! Since 2010, we’ve made other improvements as we’ve had the time and money, like laying a dark chocolate wood floor over the grimy vinyl floor, installing crown molding, updating the cabinet hardware, painting the insides of the cabinets rocket red and replacing the sink with a new one, with new faucet fixtures. 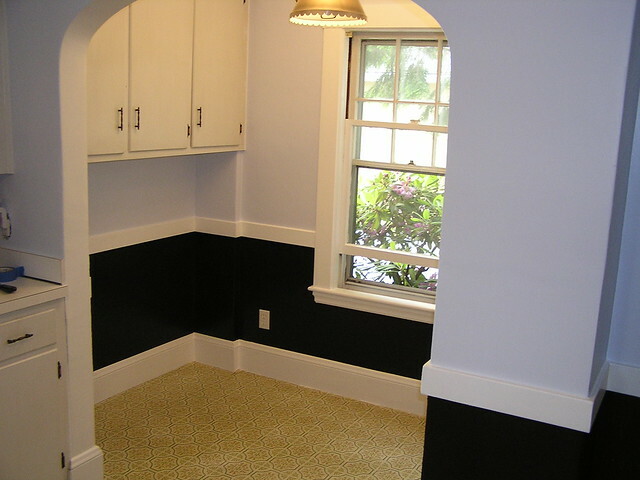 I am amazed at how sanding and color can impact a space, giving it an entirely new look and feel. Although doing everything ourselves was rewarding, I doubt we will ever choose to do it again in another house. 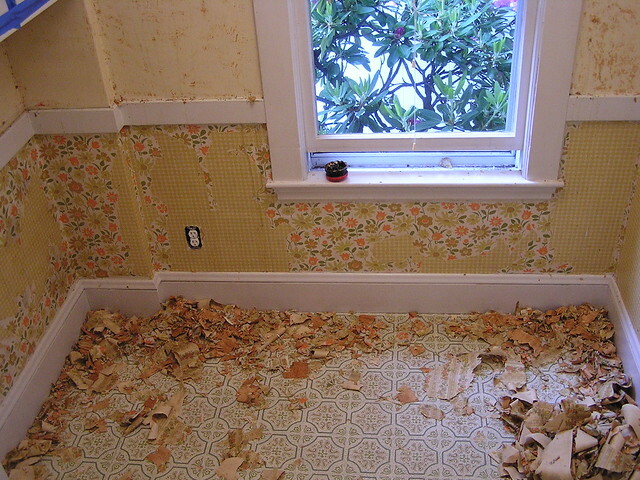 Actually, we will never move into another house with wallpaper plastered all over it. Never, ever! Your 'before' photos are making me jealous, your 'after' photos are making me weep! Very good job: it's absolutely beautiful. Oh how I completely agree. So, I second what you said! I love it! Especially the awesome chopping block/workspace..
your kitchen is gorgeous! thank you for sharing. this is so inspirational! Thanks Dianne — I love that red clock! I LOVE kitchen remodeling pics! This is an absolutely gorgeous space… so very jealous. My kitchen is the size of a closet, ha. Great work!! Thanks Katie! There is space in our kitchen, but the configuration is very weird — like two "L's" placed back to back. Typical Boston kitchen! You did an awesome job! I know how hard it is to do remodelling and how long it can take! Love the wall colours you chose the flooring looks amazing! Nice job guys! oh wow! my kitchen never looks that neat:) i love the transformation. awesome job! Especially the paper in the little cubicle. R.I.P. cute wallpaper. So glad you have a kitchen that makes you happy now! aw, now I feel bad for the wallpaper! You've made some wonderful changes to improve the functionality of your kitchen. I especially love the chopping block and the spice racks! 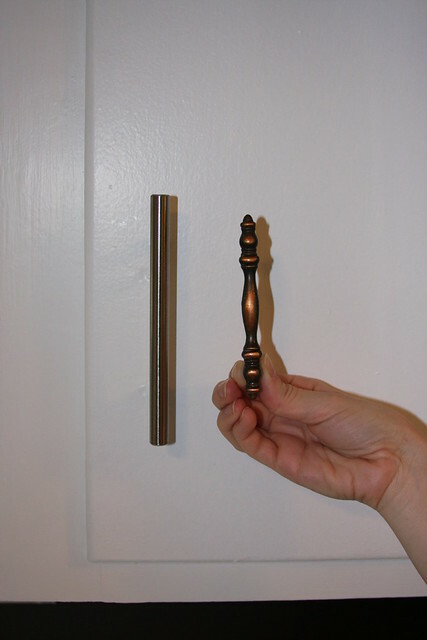 We have the same cabinet hardware as you. Thanks Andrea! 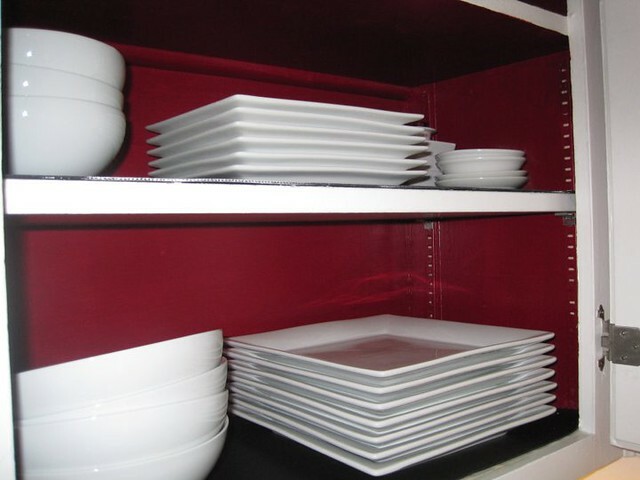 We love the cabinet hardware — it's so clean and modern! Thanks Johanna! I agree with you that the print is charming, but it had to go! You can't really tell from the pics, but it was super grimy and not it very good shape after sitting on (under?) the walls for 40+ years! Excellent job! I have some ideas already just from this post for redoing my kitchen. Problem is, I didn't decide until I read this post that I want to remodel my kitchen! LOL It looks fab and I will totally be stealing some of your ideas! ha! that's awesome — good luck Susan! Could you please give me the details of your dark wood floors? I am hoping to replace ours soon and my husband wants to take on the challenge and do them himself. I just looked at yours and they are exactly what I want. Help—details! Hi! I am glad you like. 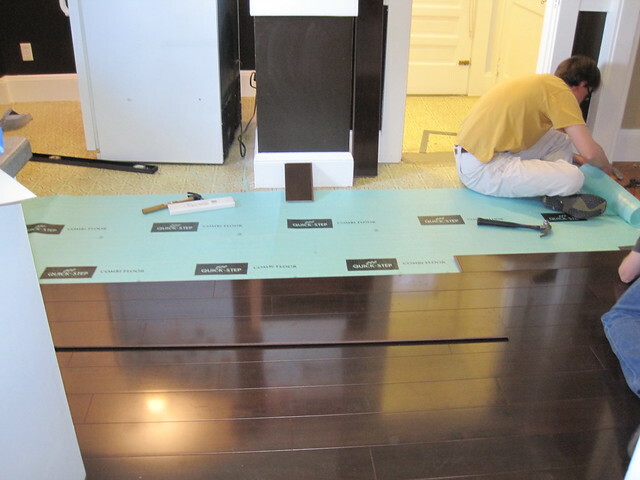 : ) We used Armstrong brand locking laminate flooring in espresso. Hope this helps! Is that pot rack/holder from Ikea? 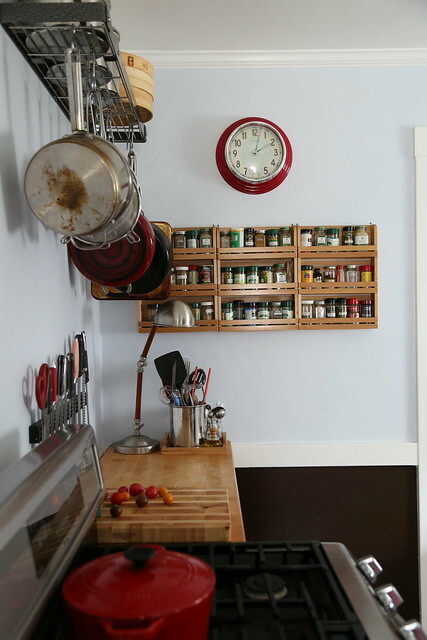 The magnetic strip and spice racks look Ikea, but didn't know if that pot rack was too! 🙂 LOVE it all. This is so inspiring, not an XXXtreme! Makeover! but instead something realistic and clean. Is there a reason you didn't put the cutting board in front of the window, instead of the fridge? Thanks Franny! While I would love to have the cutting board in front of the window, it's opposite from the oven/stove, which would require me balancing everything chopped across the kitchen. I'm hoping you can tell me where you got the spice racks and the pot holder. Both are exactly what I've been searching for . Love what you did to the kitchen, the colors are great. i don't think either of these link to the spice racks? i am also interested in where you found them. thanks! whoops, here they are Cyndi! Thanks Ann! We bought the shelf and shelf supports at IKEA. I couldn't locate an exact link, but they are all over IKEA in the wall shelving section. I've been searching for inspiration for the kitchen in my new home. For the first time, I'll be buying new cabinets instead of working around them (replacing everything but the cabinets). I LOVE your color combination. Thanks for the picture so I could visualize it. Pinned!